beat the NES version of this game on co-op with my brother. Yeah... this is gonna be a short post. Originally an arcade game developed and published by Sega in 1987, an NES version of the game was published by Tengen in 1989. 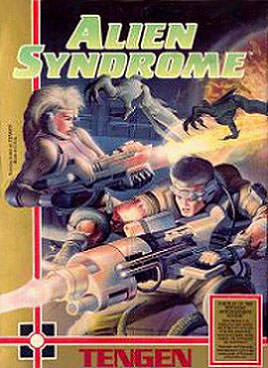 Alien Syndrome was a two-player game in which you took control of either Ricky or Mary as they attempted to rescue their captured comrades from the alien threat. Rescuing a certain amount of hostages would open the exit to the boss, which would allow you to proceed to the next level after being defeated. With an isometric viewpoint, the basic gameplay involved shooting various aliens as you tried to find your buddies. A map (showing the location of everyone needing rescue) and better weapons could be found to assist in the mission. "Take that, you squishy purple blob thingy!" I think it was the box art that always drew me to load up the game more than anything, as it stood out from my collection. I found the simplistic tunes and sound effects endearing, and really liked the design of the various bosses. I was so young when I played the game that I don't remember much else, though I have faint memories of playing co-op with my brother. "yo why u gotta hate"